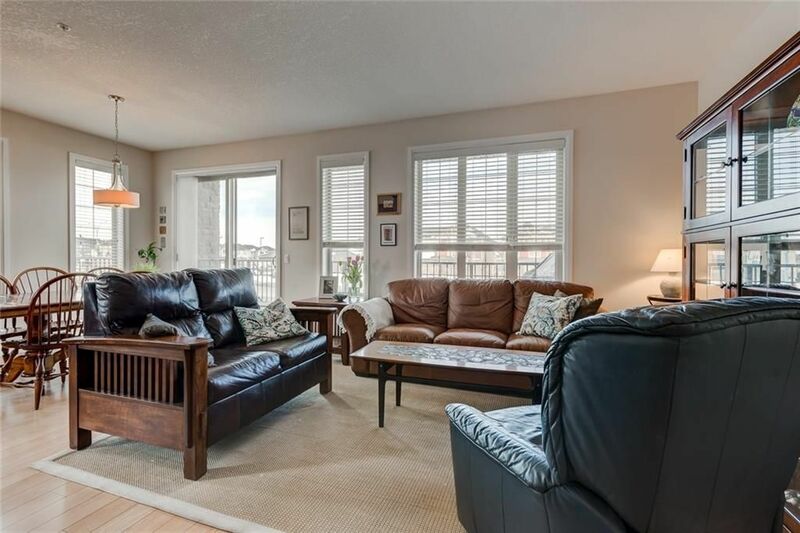 Beautiful, bright corner unit in Sunset Ridge of Cochrane! Located in one of the nicest buildings in town, with many features and upgrades that are sure to please. You are welcomed by a large entry and high end laminate floors, 9 foot knockdown ceilings and a real sense of comfortable space. Loads of big windows bring the sunshine and mountain views in to a relaxing living rm. The upgraded kitchen boasts full height cabinets & SS appliances. The large master bedrm has a walk-in closet & 3 pce ensuite w/ large tile shower. The 2nd bedroom is a really good size and could double as an office or den. A 'cheater' ensuite door takes you through to the 2nd full bath. The entire unit has in-floor heat, and there is a convenient separate laundry / storage room. All this, with 2 titled (1 underground, 1 surface) parking stalls and a large underground storage locker. 2102 - 15 Sunset Square in Cochrane. View it today! View the video to see all that this property has to offer!